Forty years ago, Eugene Kleiner and Tom Perkins set out to disrupt the then nascent venture capital industry. Kleiner, who was one of the founders of Fairchild Semiconductor, and Perkins, who was a member of Hewlett-Packard’s early computer hardware division, raised $8 million to invest in startups. Flash forward four decades, the firm has over $7 billion under management and is one of the most successful venture firms in the world. Investments in iconic technology giants like Google, Amazon, Compaq, Electronic Arts, Genentech, Intuit, Juniper Networks, Netscape, Sun, Symantec and others helped put Kleiner on the map. Kleiner, like every VC firm and investor on Sand Hill Road, has been actively looking for the next Google, with investments in Path, Square, Spotify, Klout and others. 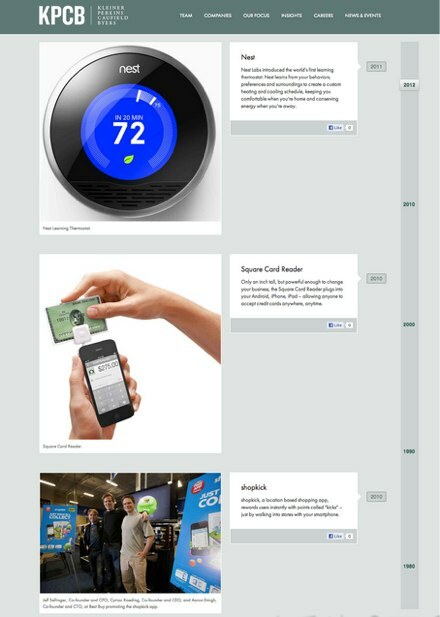 The firm is also debuting a new timeline feature today, here, which includes key milestones in the firm’s investments such as Google IPO, Genentech IPO, launch of products like Square and Nest thermostat. But there have been a few bumps in the road for the firm over the past year. Two of the company’s recent seminal investments, Zynga and Groupon, have performed dismally in the public markets. The firm has been embroiled in a heated and very public discrimination case in which Partner Ellen Pao is suing Kleiner Perkins over gender discrimination (Kleiner Perkins declined to comment on the case for legal reasons). Despite recent challenges, the firm is continuing to attempt to do what it does best — find and bet on the next wave of innovative ideas in technology. We sat down with Kleiner’s General PartneFar Ted Schlein, who has been at the firm for nearly 20 years, General Partner Chi-Hua Chien, and new General Partner Mike Abbott to discuss the firm’s past, present and future. If Kleiner’s original founders saw the firm and its strategy today, how would they react? How has the firm’s investment strategy and mission evolved? TS: Tom Perkins came back to Kleiner in the past year and talked about founding principles. What was remarkable was that founding principles from 40 years ago are the same principles under which we operate today. Basically that’s the highest value of service for entrepreneurs, to invest in an ethical and moral manner, and to figure out investments in large and growing marketplaces. Another tenet for us is to create long-term relationships with entrepreneurs. We go by the motto “someone you don’t invest in today, might be your best investment tomorrow.” Instilling these principles in every partner has been the key to our longevity. CC: I’ve been here for five years and the unique thing about Kleiner Perkins’ approach is that we are company builders first, not financiers. There are a lot of VCs out there that just want to be investors. I think what Tom Perkins and Eugene Kleiner espoused was that money is a tertiary element to the table. We’re about giving entrepreneurs value added services, and figuring our what they need to be successful. MA: I think there has been a renewed focus on digital investments compared to 10 or even five years ago. And I think this is where I see the largest and most meaningful companies being built. We’re all company builders, and I think the most impactful companies in the world are coming out of the digital space on both the consumer and enterprise sides. TS: Venture firms are an ever-evolving organism. Faces change, roles change and there are no longer three or five people sitting around the table; it’s more. The approach to venture hasn’t changed dramatically but the people have. CC: When we invest in a company, we don’t think about our relationship with that company as one with just one of our partners. Startups feel comfortable that they can build relationships with multiple partners, and every one of us brings different skills to the table. What are some of the things that differentiate Kleiner from the other VC firms on Sand Hill Road? TS: Our network is a key differentiator. We have direct contacts at tech companies and other companies at the highest levels. Hundreds of connections between our portfolio companies and connections within the Kleiner network are made every year. CC: We have partners who are board members or have contacts at every important tech company and platform company that is driving consumer web, mobile, software, enterprise, and more. MA: I’ve gotten a lot of exposure to the top firms in a lot of ways, as an entrepreneur, VC, and more. 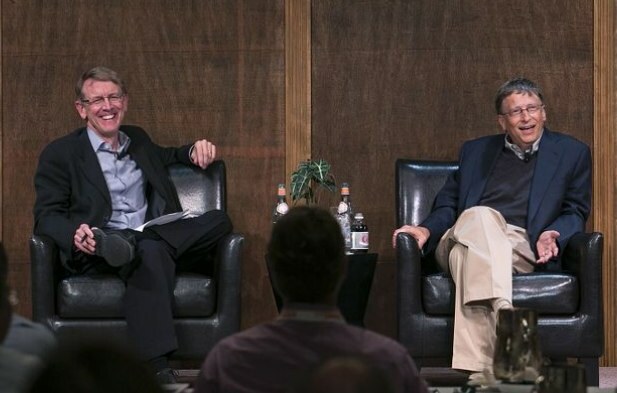 What specifically is unique to Kleiner Perkins is that when an entrepreneur gets financing from KP, the whole firm looks at how to provide an advantage to that person and startup. It’s recruiting, communications, PR, contacts on business development for sales and partnerships, and product development. And each general partner helps each other with opportunities they are working on. For example, for Path, Bing Gordon was the primary partner on the deal. But then Chi-Hua got involved to help founder Dave Morin. 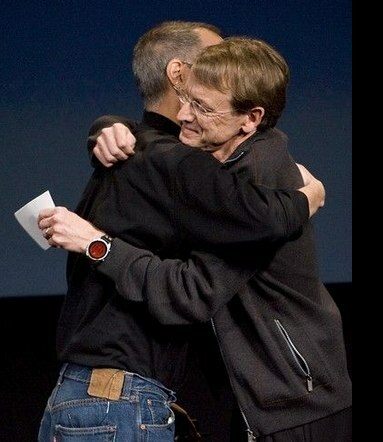 I also work with Dave on the product side. This collective group effort is very unique. What’s the biggest change Kleiner has seen in the investing world in the past 40 years? TS: The availability of capital now. When Kleiner Perkins was founded in 1972, you would have to look hard to find a VC. You could name five or six VC firms and that’s it. And our first fund was only $3 to $5 million. Not only has the availability of capital increased by quite a bit, but the kinds of capital provided are more diverse. People are differentiating what kind of capital is out there. One effect of having this abundance of capital in the market is that innovation reaches marketplaces faster. CC: In the venture environment over the past five years, everybody could write a check. But it’s what you do after you write the check that really matters now. It’s what can you do to help entrepreneurs succeed? We want to be first phone call whether the news is good news or bad news, and we want to be a valuable advisor to our startups and companies. MA: I also think the strategy which VCs find dealflow has changed considerably. Now we have to get out and build bridges and connect, whereas before deals just came in. What has changed in the company’s investment thesis? TS: What really changes for us every five years or so are the markets we are addressing and how we go after these markets. We always need to stay on the top of where markets are heading and we can’t be too late to figuring this out. Our success is being able to identify trends and markets and make early bets. This is what differentiates VC firms. What was the firm’s most important investment over the past 40 years? TS: What differentiates Kleiner Perkins over the past 40 years is being able to identify massive trends over past 40 years, whether it’s creation of the PC market, the Internet, commerce, or biotechnology. There are seminal investments in these markets for us. For example, Genentech created the biotech industry. Compaq and Lotus Development are two companies that are iconic with the PC era. Fast forward to the adoption of Internet, and Netscape showed the world what one could do with the Internet. Amazon showed us how we could buy things on the Internet. Google showed us how we could find things. We’ve bet on companies at the beginning of massive trends and have been able to make them a sustainable reality. CC: Another example is mobile. When the iPhone launched in 2008, there was no SDK or launch of an app store at the time. But we believed that there would be an enormous ecosystem around this product so we launched the $100 million iFund. I had actually just joined Kleiner at the time, and my friends on Sand Hill road thought we were crazy and that apps wouldn’t turn into anything big. But clearly it did. TS: When we started the iFund, people thought it was bizarre. At the time, the iPhone had only sold 3 million units, and there was no development platform, but we took a bold calculated chance on market trends, and took risks and that’s what venture is all about— it’s taking a calculated, thoughtful risk. CC: It’s not yet clear who will become the Google or the Amazon of mobile, but we’ve invested in every technology that counts. There’s inMobi (a mobile ad network), shopkick (mobile commerce), Twitter (communication), Spotify (music) Square (payments) and Path (mobile social networking). What company do you wish Kleiner had invested early in? What’s the one that got away? TS: Facebook. At a higher level, we want to be part of any company that will be iconic. (Editor’s note: Kleiner did invest in Facebook, but didn’t invest in the company until 2011). CC: In any innovation wave, there will be one or two companies that create lasting value. With social, we bet on Twitter and then Friendster. We identified the right trend, but we didn’t pick the right horse with Friendster. What’s Kleiner’s biggest challenge right now? MA: It’s how do you get the mindshare of entrepreneurs. Ten years ago, when I was fundraising for my startup and did a Series A, I had to bang on the doors of every VC for them to listen to my pitch. VCs stayed mostly on Sand Hill Road. That has changed completely. We have to get out, meet entrepreneurs, spend time in San Francisco, spend time at universities, events and more. What do you look for when evaluating entrepreneurs for potential investments? MA: I look for what’s the motivation for why they want to start a company. Is the connection with the idea deep? You can smell if motivation is money. You can also sense a fear of failing in entrepreneurs as well. What’s your view on Kleiner making Seed, Series A or late-stage investments? Is everyone treated the same, regardless of the amount invested or owned? TS: No. It is about setting expectations of entrepreneurs so they know they are getting what they expect from the investment. As you know VC is not only about betting on companies but also about investing in entrepreneurs. What are the biggest changes that you’ve seen in people, whether that be entrepreneurs or investors? TS: Entrepreneurs have gotten younger. MA: I agree that entrepreneurs have gotten younger. TS: The widespread information in the industry has caused a fundamental change. Investors have to react faster. The era where we could take five months of due diligence is over because the industry is moving too fast. And this sense of urgency is heightened among entrepreneurs. Entrepreneurs are impatient, but in a good way. They can get their businesses going a lot more quickly these days and you don’t need as much capital. Tell me about the CEO Summit. You had JP Morgan CEO Jamie Dimon, former Secretary of State Colin Powell, former Vice President (and current KPCB partner) Al Gore and Microsoft founder Bill Gates. That’s quite a lineup. TS: We have been doing this for twenty-some years. Our main purpose is to bring CEOs together into a setting where we can accomplish a few goals, network and help each other. Establishing relationships between our CEOs is valuable. Agendas differ from year to year but we usually have something that is focused around leadership and management. We try to work hard on giving our entrepreneurs a global vision, because they are so heads-down on developing products and getting them out the door. We want CEOs to walk away with the feeling that their minds have been expanded, they’ve learned new skills, and met new friends. 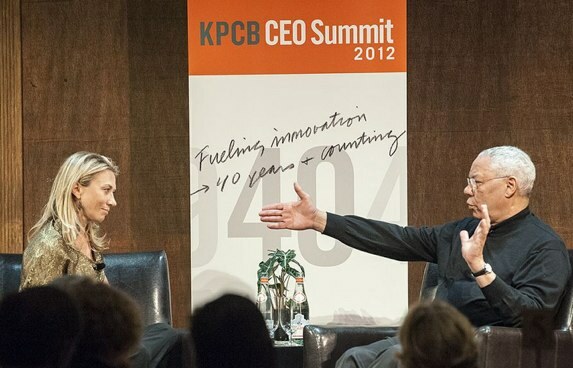 What is the brand and image that you want Kleiner Perkins to carry on for the next 40 years? TS: I hope it’s a similar brand and image we have today. Kleiner Perkins is about the entrepreneur. You go to Kleiner if you want help build a significant company. I hope that’s what we are doing 40 years from now. CC: I joined the firm because it had a reputation for being the best partners in the industry. I hope we can continue to be the best partners to help entrepreneurs pursue bold ideas and build huge companies. MA: It will be interesting to see how the next 40 years evolve. I think there will be continual shifts around venture capital. And there will be more and more emphasis in venture on how to provide scalable services for startups.